(AP) -- Alaska's Mount Redoubt volcano erupted five times overnight, sending an ash plume more than 9 miles into the air in the volcano's first emissions in nearly 20 years. Residents in the state's largest city were spared from falling ash, though fine gray dust was falling Monday morning on small communities north of Anchorage. "It's coming down," Rita Jackson, 56, said early Monday morning at a 24-hour grocery store in Willow, about 50 miles north of Anchorage. She slid her fingers across the hood of her car, through a dusting of ash. Alaska Airlines on Monday canceled 19 flights in and out of the Anchorage international airport because of the ash. Elmendorf Air Force Base in Anchorage told only essential personnel to report to work. The Air Force says 60 planes, including fighter jets, cargo aircraft and a 747 commercial plane, were being sheltered. The first eruption, in a sparsely area across Cook Inlet from the Kenai Peninsula, occurred at 10:38 p.m. Sunday and the fifth happened at 4:30 a.m. Monday, according to the Alaska Volcano Observatory. The wind was taking the ash cloud away from Anchorage, toward Willow and Talkneetna, near Mount McKinley, North America's largest mountain in Denali National Park. Dave Stricklan, a hydrometeorogical technician with the National Weather Service, expected very fine ash. "Just kind of a light dusting," he said. He said the significant amount of ash probably dropped immediately, right down the side of the volcano. Jackson said she was taking a sip of coffee when she tasted something funny on her lips - ash. She was experiencing other affects, too. Meanwhile, the volcano became restless earlier this year. The observatory had warned in late January that an eruption could occur at any time. 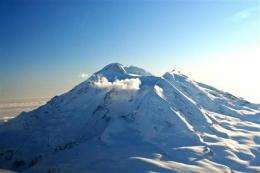 Increased earthquake activity over the past 48 hours prompted scientists to raise the alert level for Mount Redoubt on Sunday.